My Grandma used a pressure cooker. My Mom is a fan of cooking with a pressure cooker. Me on the other hand? I have resisted buying a pressure cooker for years. I am all about letting food cook for as long as it needs to in order for the flavors to come together. It seems like either people absolutely love to cook with their pressure cooker or you got people like me who hate anything that cooks anything in speed of light. And I should let the hat out of the bag right here right now: I am not a fan of microwaves either. I thought I was going to have a heart attack the day my own mother told me that she and my sister had “cooked” chicken in their brand new microwave. Now that I have let that off my chest, let’s proceed. 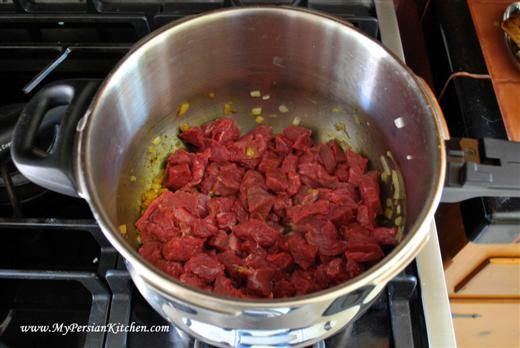 I know that meat and legumes cook faster and all the positive aspects of cooking with a pressure cooker. My mom has given me the whole run down. I get it, I really do! But what can I say, I resisted, and so did The Sous Chef, until my cooking classes were scheduled and I realized that I needed to speed up the cooking process. So after doing some research, comparing and contrasting brands, I finally broke down and bought one. I settled on a nice Stainless Steal Fagor. Since I had never cooked with one before, I diligently went over the user manual and watched the DVD that came with it. Allow me to confess that I was mighty paranoid about making sure that I did everything correctly because honestly the idea of the pressure cooker’s lid flying off and the aftermath of it freaks me out. Because if that were to happen to someone, you know it would be to me. 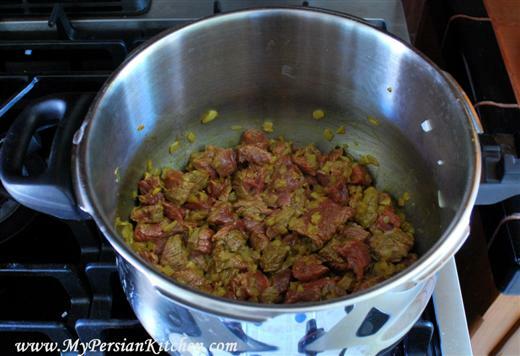 I personally find that using a pressure cooker to quickly cook meat for a khoresht is great. It’s also great to cook legumes fast. But as far as cooking a whole meal with a pressure cooker, I must say I am not a fan of. We made a meat, potatoes and veggie stew just to test it out. Even though each ingredient was cooked through with in about 20 minutes, I honestly feel that you can taste the difference between something that has cooked for a while together and built flavor in the process verses it being cooked fast. I have to say I much prefer cooking my meat in my Dutch ovens and I will probably use the pressure cooker when pressed for time. 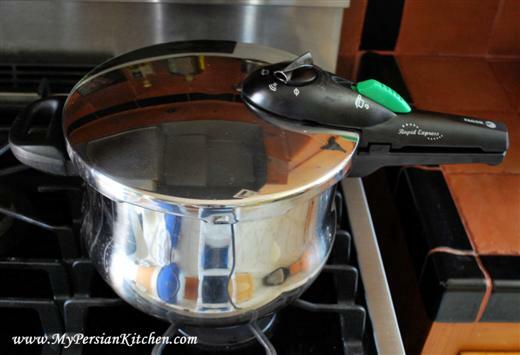 In the mean time, here is a tutorial on how to cook meat in a pressure cooker when making khoresht. 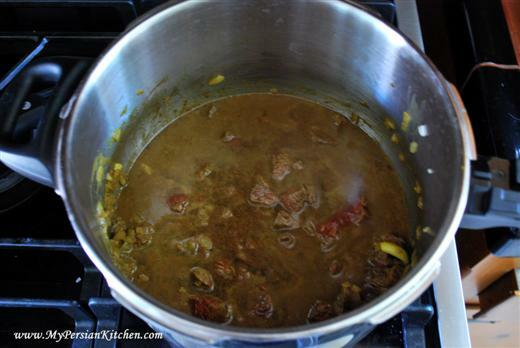 For this demo I used stewing meat. 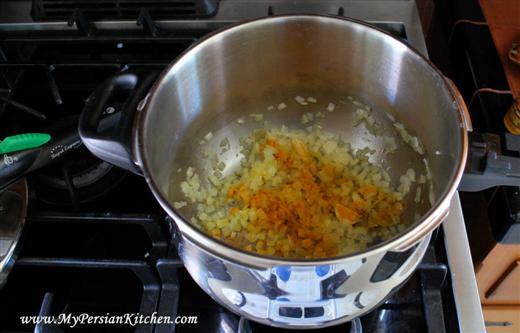 Sauté onion and garlic in some oil. Add turmeric or other spices as needed. Add meat and season with salt and pepper. Brown meat on all sides for a few minutes. Add 3-4 cups of water. Place the lid on and lock the lid. Turn the top handle to pressure cooking mode. Cook on high heat. Until the little yellow button pops up. At this point cook on low for about 20 minutes (check user manual for cooking time for the type or cut of meat that you are using). 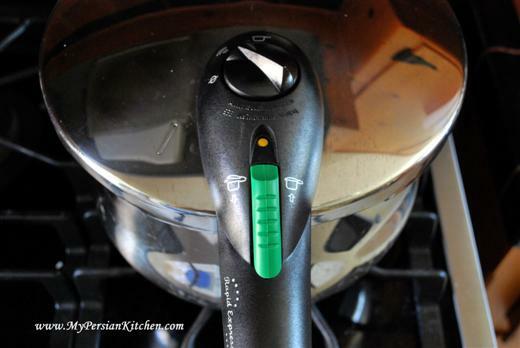 Remember pressure cooking begins when the little yellow button pops up. Once cooking time is done turn the knob to release pressure. 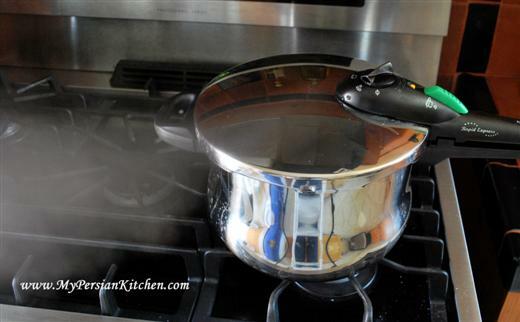 Wait until all the steam is gone to open the pressure cooker. At this point the meat was cooked through, but definitely needs some additional time to cook with whatever vegetable is going to be added to it to make a khoresht. 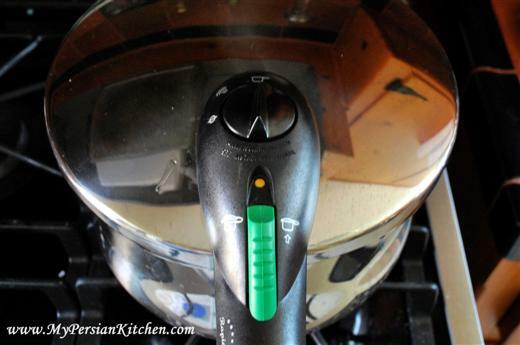 So how many of you cook with a pressure cooker regularly and what is your experience like? I used to have a pressure cooker and used it at least once a week. It was when my kids were younger and time was my enemy! but now, I do not own one, because i don’t like the taste of the food made in pressure cooker, and also I am better at time management (I think)! A note of health info, do not add salt to your meat while cooking them, it will loose all its protein, add the salt in the last 10 minute of cooking. I like your kitchen. I also love the atmosphere of kitchens. It does not mean I have warmed up towards the new colourings and design of this website. The font at the very top still hurts my eyes, but photos of food are helpful in soothing my feelings. O., thank you for the complement! I have put in the request for the colors of the banner to be changed! But I am so glad that my pictures sooth your feelings, at least I am doing one thing right by you around here!!!!! Marjan, you all are killing me!! I am trying to make it better! But I totally appreciate all the feedback because it really helps me figure things out. You need people with vision and modern sense of style! I am flying over to California! We will brainstorm this webfacethingy! O., really? When will the webfacethingy brainstorming take place? What type of Persian tea do you fancy? Thanks for the pressure cooker tips. I got one as a gift months ago and still haven’t used it yet. Maybe now with the warmer months approaching. . . This post could not be any more fitting since today my “momanny” Persian mother-in-law passed away this morning and I have many of my best Persian cooking skills due to my dear momanny. She was a “Master”, sometimes cooking 3 different meals all at once while I ran back & forth to the stores for ingredients I didn’t have; and using our very own version of communication, just enough to get the job done, and get the meal’s prepared for her son when he came home for “nahar”/lunch or the late-evening meal. The pressure cooker: I don’t want to go on & on, but I’ve also fallen victim to the convenience of it over the years. That said, now that I’ve reached a certain amount of experience at this, I can truly say that there is nothing like a slow, low-to-medium low 75min. – 2 hr. cooking on a gas stovetop for true flavors to melt into one and assert themselves. And there is a very delicate balance in the pressure it should be kept at, which is a fairly lethargic/slow bobbling of the removable top placed on the metal stem. 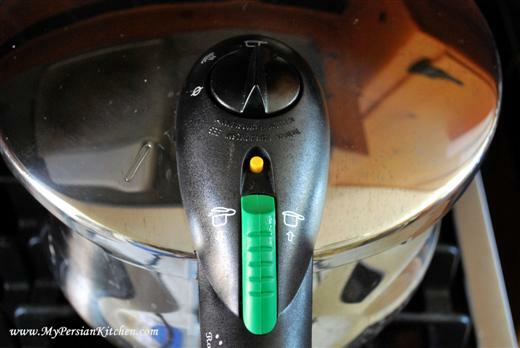 If it bobbles too fast and there isn’t enough liquid, you’ll have a burnt – on mess that will ruin your pressure cooker. If too slow, it won’t cook enough and likely be waterly and flavorless. So, as with everything, to achieve even 75% of the success of traditional cooking technique, it takes some experience to know your pressure cooker, timing and it can be tricky. Readers of this blog! Take HEED, if you are just learning Persian cooking, it may be wise to follow the traditional cooking method and recipes and get the hang of those first. Then, if your hooked on Persian (and you WILL be!) then you can advance to pressure cooker. Also, crockpots are another common convenience to the Persian wife who may work during the day. I cannot speak to that as much, but perhaps that might be another alternative? In any case, if you can’t cook it slow, get your pressure cooker out. Life just can’t be fully experienced without Persian food! And I’m a born and bred Missouri girl! I have a pressure cooker, but seldom seem to use it. I guess it is a matter of getting into the habit and remembering that it is there. Cynthia, thank you for your comment. My deepest condolences to you for your loss. I do agree with you there is nothing as good as a meal that is cooked slowly and not under pressure. You can completely taste the difference. I love hearing about non-Iranians who cook our food and have much appreciation for it@ Keep on cooking Persian food!!! A pressure cooker makes food taste bland hands down. There is no argument here. You will never see an award winning chef use this decvice. The pressure cooker should only be used if you are desperate for time. Perhaps if you are a working all day and need to cook something fast or if you are on a boat and need to save on propane. Never Ever will this food taste good and at best it will be acceptable. Professional Cook, I ardently disagree with your stated contention that there “is no argument” about using a pressure cooker. 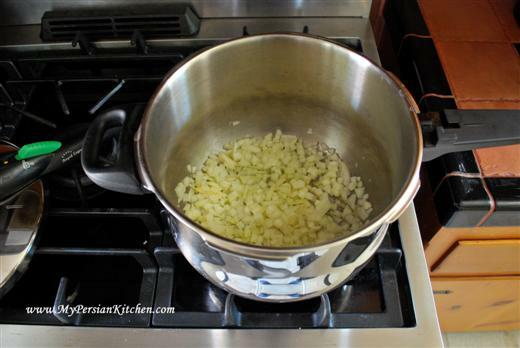 1) Professional chefs use pressure cookers in premier restaurants all the time. Are you saying that their food is always “bland”? 2) Also, your idea that it makes food taste “bland” implies to me that the trouble is more with the operator than the device! Someone who doesn’t know how to use a pressure cooker correctly will certainly produce poor food. All recipes need to be adjusted for a pressure cooker. For example, a pressure cooker generally requires less liquid to be added. 4) The correct pressure cooker actually seals in flavour. The Fagor model that is shown here is excellent, as are the Kuhn-Rikon models. thank you for sharing your thoughts. I do specifically say in my post some absolutely love cooking with a pressure cooker and some don’t. In my post simply expressed by personal opinion as far as cooking a whole recipe based on my own personal experience.